Wednesday saw me snatching a few hours on a clear river with the air temperature dropping fast after dark. Hopes were not high. I blanked. 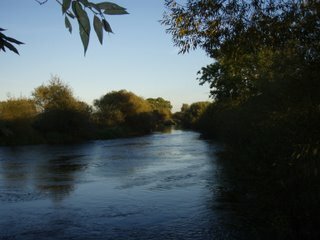 Sunday was another bright autumnal day, the Trent had a touch of colour but was still low. Apparently it had risen a foot in the week and dropped straight back down again. I settled on the dreaded burdock swim, and within forty minutes of casting out the expected rod pulled round and I connected with.... Nothing! On recasting I pulled a bit of line from the baitrunner and remembered that I had slackened it off while packing away on Wednesday. I have a horrible feeling that whatever made off with my bait had simply failed to get hooked against any pressure. As the sun dropped in the sky it became noticeably cooler and I donned the trusty bunny suit. While it was still light the same rod lurched again. This time I felt the fish heading for the snag. then the line went slack. I'd lost the lot, and the lack of any pigtailing on the mono suggested it was not knot failure but a cut off. Around five hours later, with my scarf pulled up over my nose and my eyes closed I heard something that sounded like a rod falling over and line being taken. Surprisingly it was the upstream rod that was lying on the deck. Connected to it was another 'flappy thing'. As with the last couple of five pound 'flappy things' it went back without a picture. When I packed up at eleven the air temperature had dropped over ten degrees C from when I arrived to a positively wintry 4! I continued downstream to a spot I hadn't fished before ,and a boilie went in under the rod end where some overhanging grass provided cover over a clear patch before the streamer weed starts, and a pellet was cast beyond the streamer weed that extends to mid river and wound back to the weed. Then I sat down to bag up some pellets and tie some rigs before it went dark. Within a few minutes the close in rod showed signs of chub activity. It was an overcast evening so I wasn't too surprised. I was in the middle of tying up a spare pellet rig when the rod arced over and the baitrunner buzzzed like an angry wasp. 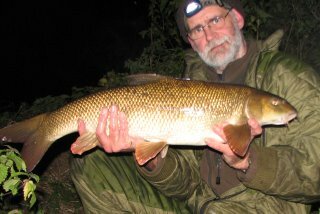 However, when I leaned into the fish it didn't feel like a barbel heading downstream, more a flappy thing on the end of the line. A bronze flanked chub was soon wallowing in the net. 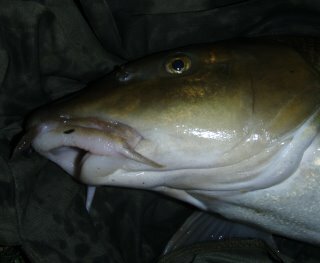 I then got a premonition that the barbel weren't going to play, but the chub were. After dark I wound one rod in and spent an hour in a swim that I am sure will produce for me eventually. One day I will have to give it more time, or perhaps it needs more water in the river, but it is going to throw fish up. This time it didn't, so I moved to a swim that rarely fails me. Almost straight away both rods showed chub rattles, and it wasn't long before the downstream rod rattled, and kept on rattling telling of a hooked chub. Another five pounder was quickly returned. Half an hour later there was a repeat performance. My premonition had been right. One more move, to the 'rat hole', to try and get a barbel. I spent the final hour and a half of the session listening to the scurrying in the undergrowth with just one chub tremor and no fish to show for it. I got 'that feeling' again, and found myself loading the car with the barbel gear without realising what I was doing! I half hoped to find the river with some colour in it, but by the look of things it had risen a couple of inches and fallen back. It was as clear as it had been on Monday with willow leaves visible on the bottom in many places. The plan had been to head for the length I'd fished on my last two trips but a slow moving truck making the right turn I take to get there decided me to head to the next bridge downstream. When I got there I thought I might as well have a walk and suss out the swims on the bank I had yet to fish on the upstream stretch. It was amazingly warm for early October, yet the damp vegetation had the tangy smell of autumn. Everything looked and felt right, so I went back for the tackle. As Fallon was getting ready to declare her love for Ed the tip of my upstream boilie rod, positioned in a clear patch between the streamer weed downstream of a bush, pulled down in no uncertain fashion. 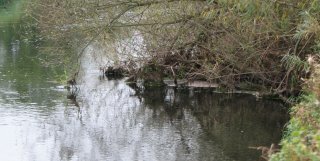 I couldn't believe it, as I was sure the 10mm pellet fishing above the next trailing willow would have been the banker as it had already produced a bait-size chub. 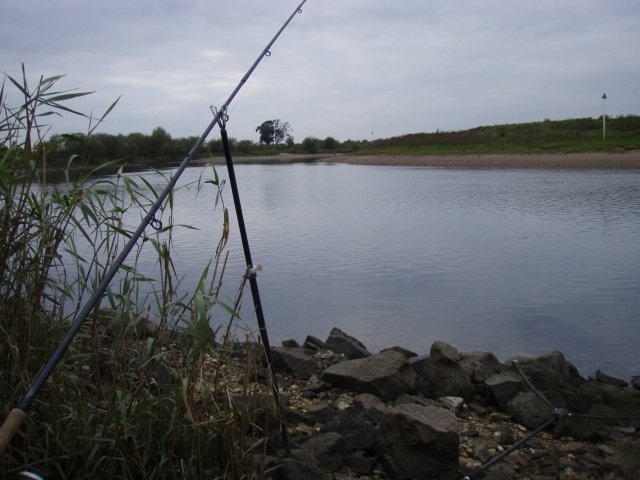 As I leant into the fish I realised that I hadn't planned how to land a fish from this swim. I also discovered that it was darker than I'd thought and struggled to see where the fish was. After almost losing my footing altogether I managed to net the barbel and hoist it onto the bank. It was bigger than I'd first imagined. Spot on nine pounds. By the time it was returned I was just in time to catch Fallon being rejected by Ed and storming off in tears. With one fish caught it was worth stopping a little longer. I wasn't able to see where the clear patch was now it was dark, so imagine my surprise when, less than half an hour later, the same rod indicated a few small taps and pulled down again. This felt odd. There was obviously a fish attached but it felt very heavy, and wasn't doing much in the way of pulling back. When it came into sight it was clear why. The lead was festooned with a huge lump of weed. This time the netting process was easier as I knew where to put my feet, but with it being such a warm night the midges were out in force and, attracted by the head torch I had put on, were flying up my nose and in my mouth. Another nine pounder. I gave it a further hour and a half before moving. The next swim also had a downstream raft to fish to, but was open enough to allow a second bait to be cast out to the far bank bushes. Unfortunately it was too dark to see where I was casting, and having spent a few hours with a bait dangling in mid air a few weeks back I didn't want a repeat performance. So I just cast the pellet out about three quarters of the way across the river, the boilie going downstream to the raft. The baits had been out about an hour when the raft rod pulled round. Unfortunately the fish fell off after a couple of lunges and I wound in some weed. I rebaited and checked the hook point. It needed touching up. Don't let anyone tell you that chemically sharpened hooks can't be honed back to sharpness. This one was better than it had been when fresh from the packet! A further hour passed and I needed to relieve myself. 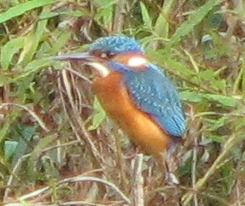 No sooner had I turned away than I heard a baitrunner whirring. The same rod was away again, but this time the fish stayed attached and was easily netted, I'd planned things better in this swim! Rebait and recast. Earlier I had wound in the pellet rod only to find the hook buried in weed, the pellet gone and the loop it had been tied on with opened out. I dug out a nylon boilie rig, attached a boilie and a pellet, hooked on a bag of some new magic beans and chucked it out blindly. It was getting late now so I started to tidy my gear away, removed my superfluous bunny suit so I wouldn't cook on the walk back to the car and then picked up the midstream rod to wind in. It felt like the rig was stuck in weed. Then the weed shook its head and set off downstream. Most peculiar. After a not particularly arduous fight I netted the fourth nine pounder of the session. 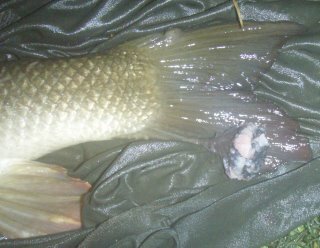 A fish that had a tumour like growth on the lower lobe of its tail, but otherwise looked as fit as the other three fish. Enough was enough. I packed away the other rod and set off back to the car. The water temperature had been 13 degrees C, and when I looked at the thermometer in the car the air temperature was still reading 15.5 degrees at midnight. No wonder I'd been working up a sweat every time I moved swims or landed a fish. It's October, the sun is shining, the postmen are on strike and I'm free to go fishing. Trouble is the rivers are low and as clear as tap water. Thursday saw me making a late start and not expecting anything until gone dark. Sure enough nothing did happen in daylight. The river was all but deserted so I planned a bit of swim hopping and was contemplating a move at eight when the downstream rod top pulled round steadily and slowly. Most odd. There was a fish on, but not doing anything. It continued doing nothing until it got under the rod end. I was hoping it would turn into a lump of a fish at this point but it didn't. What it did do was make one run straight into some trailing branches and get stuck. It then wallowed a few inches below the surface. Pulling on the line did no good, so I slackened off the Baitrunner and left it. The fish took some line which I then wound back on to the reel - and the fish back into the same place it had left. Stalemate. As my landing net wouldn't quite reach the fish I added the spare extension, but it still wasn't quite long enough to get the net under the fish. So I swatted at the branches with the net! While I was doing this I saw the isotope on the rod tip move to point downstream. The fish had come free! Even now it refused to fight and allowed itself to be slid over the net. No leviathan, but a welcome eight pounder under the circumstances. I had hoped to get a full day in on Friday but again I got sidetracked and arrived at the tidal Trent early in the afternoon, hoping it might have more colour than everywhere else only to find it low, gin clear and with very little flow. After a couple of hours driving around and walking the banks I decided to get the baits out. I might just as well have come straight home. Feeling decidedly un-hopeful, and having packed an empty gas bottle for my stove, I wrapped in early. I didn't like the company much either. The postmen won't be back at work until Wednesday so I have a few more days to fill. If only the rivers had some colour in them. Still, if everyone else is staying away because it's a struggle I could be on for a big fish - if I can find one.